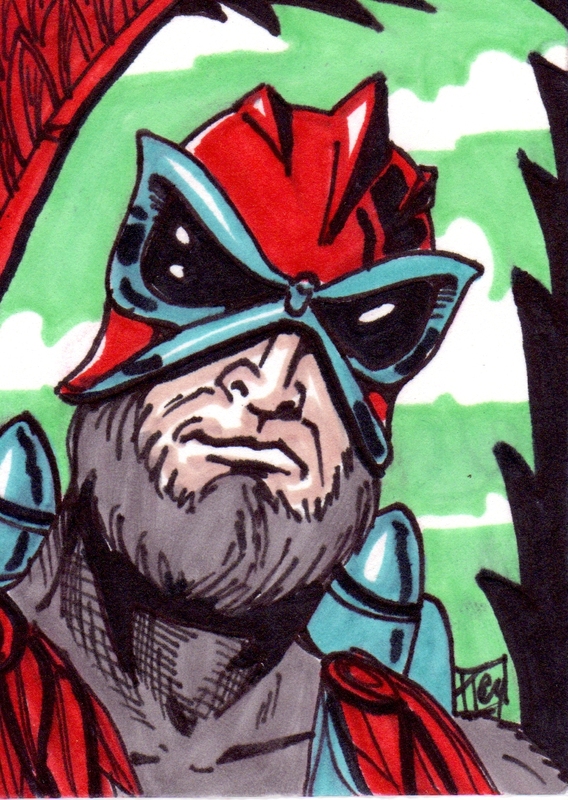 Taylor's Sweet Little Art and Nerd Site: Sketch card of the day!- Stratos! Sketch card of the day!- Stratos! And the daily sketch card is... Stratos! Growing up, I was not that big of a fan of Stratos, but I have definitely grown to like him very much due to the 200X series. This sketch card of him is the 200X interpretation and in my opinion, the best design of him. I have him posted here on deviantart. Just to remind you, I have 5 more days of voting on my new t-shirt design on threadless. If you have an account and want to show your love by giving the design a vote of 5, go here to see its posting. Also, I will have a table at the upcoming Dallas Comic Con May 19th-20th. Both Rob Payne and I will be there at the table promoting The Unstoppable Force and Xenex the Bug Man! If you are at the show, stop by, say hello, and show your love by picking up one of our comics! Sketch Card of the Day- Tung Lashor! Sketch Card of the day- Mekeneck! Sketch Card of the day- Clawful! Sketch card of the day- The Sorceress! Sketch card of the day-Teela! Sketch card of the day! -Mantenna! Sketch card of the day!- Kobra Khan! Sketch card of the day!- Tri-Klops! Sketch card of the day!- Leech! Sketch card of the day!- Count Marzo! Sketch card of the day!- Buzz Off and King Hsss! Opening a shop for tee designs gone awry!